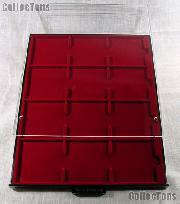 The Lighthouse Coin Case System is a system of trays, cases and locking aluminum boxes. 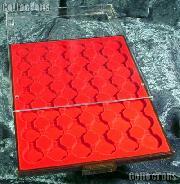 The coin trays are actually drawers that come in cases with crystal clear tops. 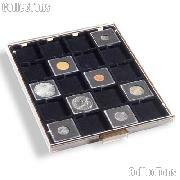 The coins are visible and protected within the case and can be accessed by sliding the drawer open. The ultimate in convenience, protection and security while displaying your collection. Pack your coins into the trays and cases, place the cases into a locking aluminum boxes and head for the coin show! Lighthouse aluminum coin boxes are lined in red velvet, have a locking mechanism with two keys, comfortable and secure carrying handle and four rubber feet. Exterior of the case is formed of textured aluminum and reinforced at edges and corners. Box Size (LxWxH) Capacity Locking? 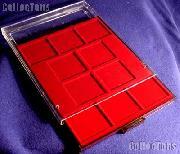 Lighthouse coin drawers are formed with translucent brown plastic and lined with red velvet. Each drawer is inside a clear stackable frame and is the perfect size for Lighthouse Coin Boxes (described above), shelves or cabinets. Single compartment rectangular drawer (210mm x 270mm). Spaces will also hold any coin or capsule with a diameter up to 25mm. Spaces will also hold any coin or capsule with a diameter up to 27.5mm. Spaces will also hold any coin or capsule with a diameter up to 30.5mm. Spaces will also hold any coin or capsule with a diameter up to 34mm. Spaces will also hold any coin or capsule with a diameter up to 37mm. Spaces will also hold any coin or capsule with a diameter up to 42mm. Spaces will also hold any coin or capsule with a diameter up to 44mm. Spaces will also hold any coin or capsule with a diameter up to 45mm. Spaces will also hold any coin or capsule with a diameter up to 47mm. 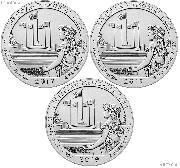 For 1 set of 5 original sealed 10 DM / PP commemorative coins. 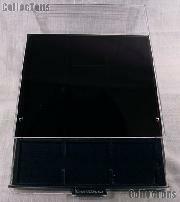 Single compartment measures 150mm x 150mm. 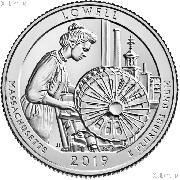 For 10 original sealed 10 DM / PP commemorative coins. 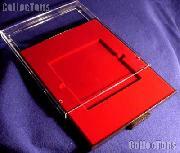 Contains 10 compartments, each measuring 69mm x 62mm.